Resham Daswani is the founder of Spiral Spaces—a "platform dedicated to conscious evolution"—and co-founder of Hong Kong-based spiritual retreat The Garden Gathering. Specialising in the practice of Cha Dao, she uses tea to help people connect with nature and, ultimately, with themselves. Recently, Resham teamed up with 10 Chancery Lane Gallery, where she hosted a tea ceremony amidst powerful artworks by Chinese contemporary artist, Huang Rui. "Huang Rui—one of the key leaders of the first free art expressions during the Post-Mao era," she says. "Rui's ink paintings' achievement is in the expression of "space" itself, which I found to be a beautiful reflection in the approach to Tea." We spoke to Resham to learn more about this ancient ritual and how it promotes mindfulness. For those who don’t know, what is Cha Dao? Cha Dao or ‘The Way of Tea’, is a path to the meditative mind. Tea helps us rest in the space of our true self, where we can cultivate inner harmony and an awakened presence. 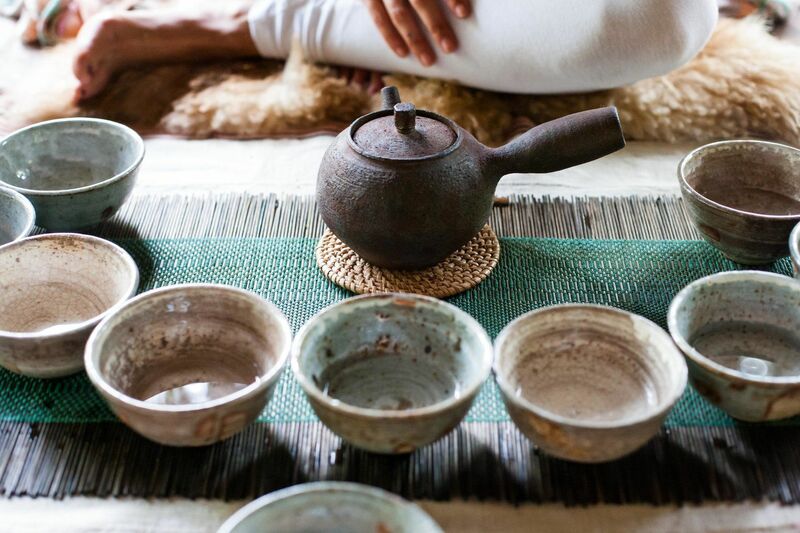 A Tea Ceremony is a dance of the elements–the earth, fire, water, air and Qi of tea come together to create space for meditation and reflection. We learn how tea connects us to the energy of nature through the leaf. As we begin to tune in, each sip becomes a journey and we are guided from our mind, body and spirit and rejuvenated with clarity and peace. The ceremony takes place in noble silence and there is a space for questions and reflection at the end. What inspired you to take up this art and, ultimately, share it with others through hosting your own ceremonies? Throughout my life I have had this feeling, or calling, to cultivate myself towards a higher path and to help others do the same. Several years ago, I was pursuing a career in the art and design industry and felt intuitively called to visit a Zen monk in Taiwan. I trusted and went and ended up meeting my teacher Wu De, the founder of our Global Tea Hut community. He has devoted nearly 30 years of his life to tea. I found an infinitely renewed connection with Earth and spirit. I returned to Hong Kong and have since been dedicated to sharing The Way of Tea, so others can explore the sacred benefits of the leaf. How has dedicating yourself to this practice impacted you/your life? This practise has shifted my way of living completely. I began to realise that the more I would show up with reverence in one aspect of my life, it would have a ripple affect on everything else. On a practical level, this consistently shifts the way I consciously operate day-to-day. From where I eat, shop, live, travel—I am more aware and connected to the effect my actions have on our planet. How does Cha Dao help promote mindfulness? Everything from the sound of the water to the crackle of the fire invites us to arrive into the heart space of the ceremony. Tea reminds us of our deep connection to nature through smell, taste and feel. We become aware that the energy of the sun, the mountains and rain are in the very leaves we awaken with hot water. We remember that we too are nature, which is very healing for our mind, body and spirit. There is something very powerful about drinking Tea mindfully. What are some of the benefits of Cha Dao? The qualities of Tea are ‘calm and awake’, which is our natural state of being. From here we are able to change our relationship with our experiences and reflect, heal and navigate life with greater clarity aligned with our true purpose. This allows us to cultivate greater emotional intelligence and self-awareness to manage stress, anxiety and other common city-based pressures.